Premium, mid-range or budget: which tyres are best? Fleet managers face an almost bewildering amount of choice when deciding which tyres to use. The Tyre Industry Federation says that more than 300 brands sourced from more than 45 countries are on sale in the UK. These can generally be split into three categories: premium, mid-range and budget. Tyres in each category have their own strengths and weaknesses, meaning that when fleet managers have to choose a brand they must – pun acknowledged – tread carefully. 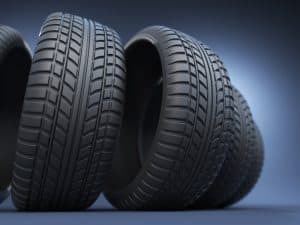 It is estimated that around a third of a fleet’s maintenance budget is taken up by tyres, meaning that whatever choice is made can have a significant impact on costs, from price to wear and fuel economy. More importantly, they can also have a significant impact on safety. Company car replacement tyre authorisation is almost exclusively on a like-for-like basis and that means up to 90% of models are fitted with premium brand tyres – Michelin, Goodyear, Pirelli, Continental and Bridgestone, according to Peter Lambert, fleet director at Kwik Fit. Kwik Fit has seen a growing trend for van operators moving from premium towards mid-range tyre policies. “‘However,” says Lambert, “currently half of replacement van tyres are mid-range. The majority of van tyres are replaced due to damage rather than wear. That is unlike the vast majority of company cars where 80% of tyres replaced are due to wear. The average tyre consumption across Kwik Fit’s fleet customers is about 1.65 tyres per vehicle per year. The damage means fleets are not always getting the maximum benefit from their investment in premium tyres, says Lambert, so managers are choosing to limit their cost exposure and opting to fit a higher percentage of mid-range tyres to vans. However, there is no one-size-fits-all answer to tyre choice, says Andy Fern, head of fleet at Michelin, and decisions should be taken fleet-by-fleet and with the direct help of the manufacturers. Many facets must be considered including price, fuel saving, safety, longevity, supplier support, and the occurrence of tyre damage. Read the full story on Fleet News. Sign up to our free monthly newsletter emails!